The Open60AAL – which was designed and developed by Innovation Yachts – will deliver ultimate proof of quality, safety, functionality and durability of the Innovation Yachts philosophy. It’s being built using 100% sustainable and recyclable materials and the project will test to the limits “real” boat building solutions – such as recyclable composites, harmless matrix systems and natural core materials. Around the world single-handed, nonstop and without assistance is widely regarded as the ultimate test of seamanship and courage. Enduring month upon month in his own company, Norbert will be forced to pit his nautical prowess against torrential storms, ice, fierce oceans, loneliness and frustration during a distance of about 34.000 nautical miles. Both grueling and dangerous, ANT ARCTIC LAB is a serious test of mind, body and soul. 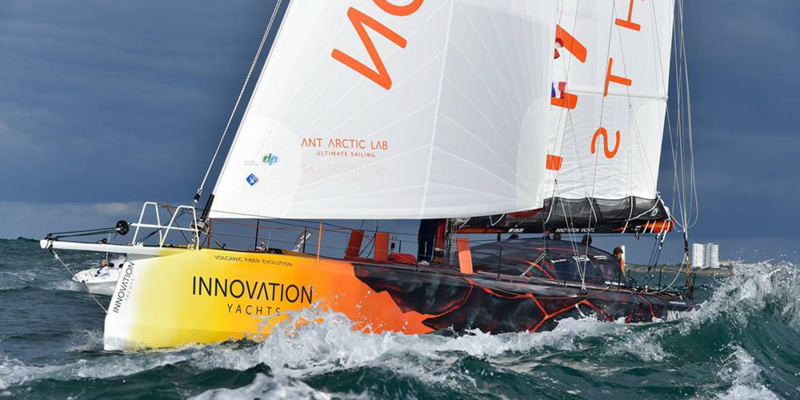 The 34.000 nautical miles ANT ARCTIC LAB Challenge will take the concept Around Alone and Laboratory testing to new heights to succeed in this epic quest. Testing technological, software and engineering developments – for ultimate proof of quality, safety, functionality and durability and of course, setting a new sailing world record are the main goals of this project.